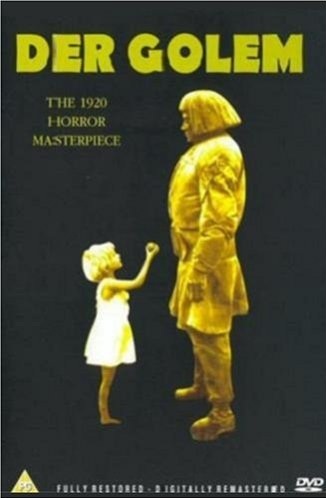 A classic of German silent cinema and a highly influential early horror film, especially on James Whale's Frankenstein. 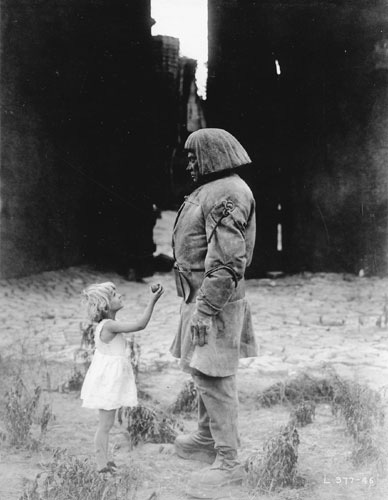 The superhuman, lumbering, mute monster on the rampage owes more to this movie than Mary Shelley. 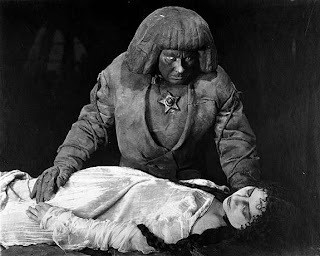 The Golem is activated by an old Rabbi to persuade the King to give the Jewish community a break. But while his intentions are good, the power of such a creature is tough to control... The Medieval age of this legend reminds us that Jewish people have been relegated to ghettos for centuries. 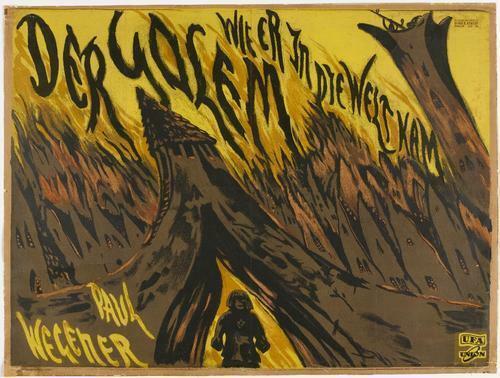 The Golem movies served as a reminder that it was happening again. 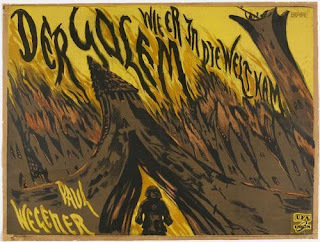 Paul Wegener is one of the earliest icons of horror movies, also starring in The Student of Prague (1913) as The Devil, and in The Magician (1926) as an Aleister Crowley/Dr Frankenstein combo. Here Wegener appears as the Golem for the third time - the earlier films only survive in fragments (see my overview of the other early Golem movies). 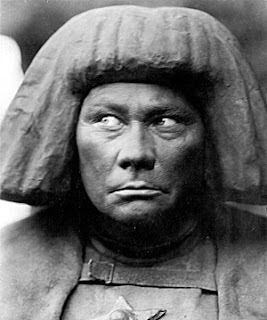 His portrayal is a prototype of 'the robot who develops human feelings'. The make-up looks convincingly like clay, even from a distance. I'd not been very impressed with this film after watching it on VHS, initially drawn in by evocative production photos. 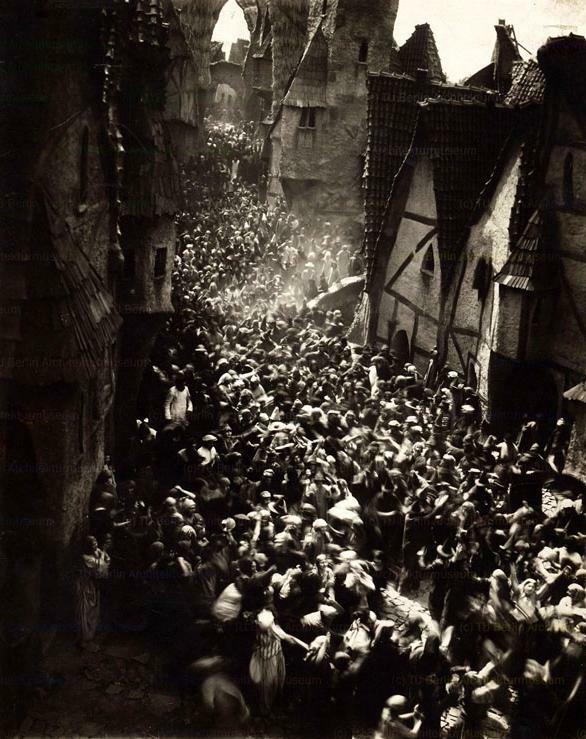 I foolishly assumed that there was a German village somewhere that actually looked like this! I hadn't counted on an old European silent movie really going to town on the construction of entire streets, towers, archways and a colossal main gate. It starts as a small fable but builds up into an epic! Finally seeing a decent restoration, on DVD, I could more easily follow the complexity of the story and enjoy the detail of the production design. For instance, in the Rabbi's house, there's a staircase shaped like the inside of a huge seashell, that somehow doesn't look out of place. 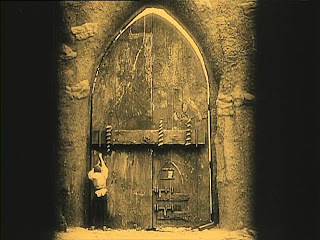 The set design isn't as expressionistic as The Cabinet of Dr Caligari, but there isn't a straight line in sight, recalling hand-sculpted, primitive architecture, but with a menacing edge. It could easily be a full-size corner of Halloweentown from Tim Burton's The Nightmare Before Christmas. The cinematography is impressive, besides the visual effects (probably done in-camera). One static shot starts on a wide shot, then a character creeps right up to the camera to show us something hidden in his hands, only a few inches from the lens, and then returns to the back of the set. An impressive follow-focus just to avoid cutting to a close-up. Comparing the Eureka DVD (at top) to the UK VHS release (above), the intertitles are certainly an improvement on simple electronic white captions. While they're now elaborate, gothic and suitably scratchy, they aren't original. This is probably unavoidable because of the age of the film, but a note to explain what is from 1920 and what isn't would have been appreciated. 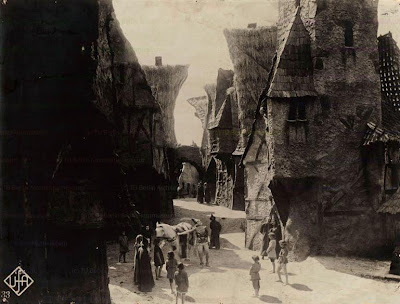 Especially as they use elaborate CGI tricks that place text into the action - on pages of old books, as letters and a fluttering parchment, all digitally constructed and animated, but not as strict recreations of the original shots. These new close-ups of text also crucially miss out the character's signatures so we don't know who they're from. Another difference from the VHS version was a scene during the invocation ritual - lightning flashes are now visible (reminiscent of the arcing electricity in Frankenstein's lab). 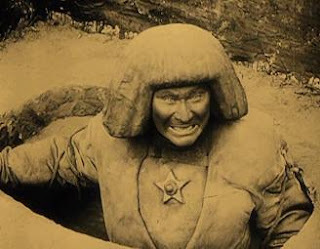 Also, a crucial close-up of the Golem smelling a flower has been changed to a frontal angle that catches the action better. A fly lands on him in both of the angles, indicating that two cameras were used in filming (usually one negative for Europe, one for overseas markets). The DVD restoration also adds a welcome coloured tint that changes with every scene. 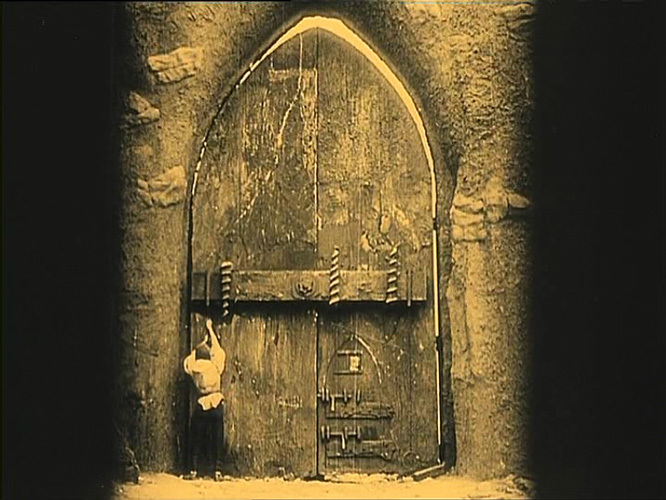 The UK region 2 DVD from Eureka also includes an impressive overview on expressionism in silent German cinema, illustrated with wall-to-wall clips. Overall it's an impressive-looking restoration, but I'd have wished for some pointers as to what had been reconstructed and what was original, especially as the film is a touchstone for film study. Thanks to the anonymous commenter who corrected my poor history/geography. I had a completely short-circuit of logic! Wow, this sounds amazing. I'm not a huge fan od Dr. Caligari (I think it's kind of boring) but I do enjoy the crooked set design and art direction of these films, this sounds great, I need to give it a go already!